Plus a special Customer Appreciation Coupon! Professional Carpet & Upholstery Cleaners Inc. owner Dan N. and fine area rug specialist Keith discuss what makes area rug cleaning and stain treatment different from typical carpet care. 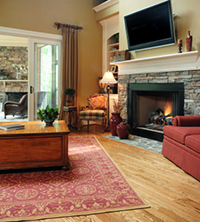 Get the facts on area rug care here! Also, check below the article for a customer appreciation special! Q. Good morning Dan and Keith! After a challenging Minnesota winter, many people are ready to have their fine area rugs cleaned. Could you tell us about how area rug cleaning is different from typical carpet cleaning? Dan. Sure - our area rug cleaning practices take into account a variety of factors that require special attention and diligent effort. If you've ever wondered why, today we'll explain! Keith. Yes, and importantly, where typical installed carpeting comes in a specific range of fiber types and configurations, the fibers and attributes of area rugs can vary much more widely. For this reason alone, our training and formal education is an important factor in our ability to appropriately clean rugs. Q. I'm glad to hear there is specific training for area rugs, and it seems logical, but could you describe some specifics? Keith. Beginning with the variety of fibers, we clean and stain treat everything from wool to silk. These fibers are not typical of household carpeting, so as we begin cleaning a fine area rug we first assess the fiber content, weave and color arrangment to determine the correct approach for cleaning. Then, in a more methodical process, we are aware of potential bleeding of colors or the need for additional rinsing due to the structure of the carpet weave. These details, while they might not seem like much, take extra time on our part. However the extra time and diligence will produce a thorough rug cleaning while also protecting your valued carpets. Q. That's very interesting, I guess I always thought that all carpets were alike! Now I know why extra time is required to care for area rugs. Are others ever surprised? Dan. Yes, I have received a few calls over time, inquiring as to the price difference for area rugs versus carpeting. This is precisely the reason - our education, extra time, and sometimes specific cleaning resources are called into action for these typically more delicate carpets. Keith. It is also probably helpful for our customers to know that our IICRC certification and training, and our 30 years experience, are vital to our confidence in cleaning area rugs. Some stains can be particularly challenging to remove, especially after a Minnesota winter, exposure to dining areas or pets, or just long-term everyday wear. We can help because of our depth of knowledge and experience! Q. Thank you both for your time today! I feel much more educated about area rugs and rug cleaning. Dan. You're welcome! And if you have any additional questions, we welcome those any time, just give us a call! Questions? Feedback? Give us a call at 651-645-0244!